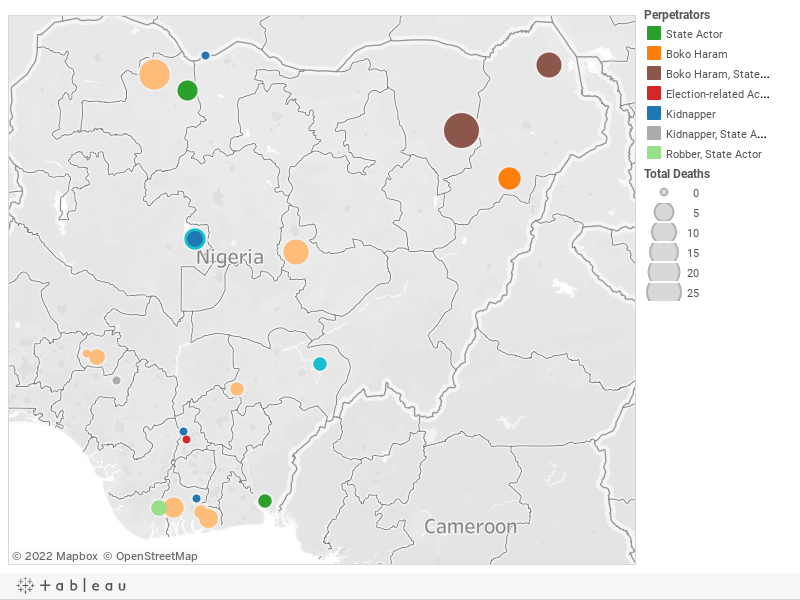 Below is a visualization and description of some of the most significant incidents of political violence in Nigeria from December 22 to 28, 2018. This update also represents violence related to Boko Haram in Cameroon, Chad, and Niger. These incidents will be included in the Nigeria Security Tracker. December 22: Bandits killed seventeen in Maradun, Zamfara. December 23: Boko Haram killed three in Chibok, Borno. December 23: Gunmen killed five in Abua/Odual, Rivers. December 24: Kidnappers abducted two Catholic priests in Anambra East, Anambra. December 24: During a Boko Haram ambush, thirteen Nigerian soldiers, two policemen, and "many" (estimated at ten) Boko Haram militants were killed in Damaturu, Yobe. December 24: Gunmen killed four in Gokana, Rivers. December 25: Boko Haram killed four in Chibok, Borno. December 25: Gunmen killed five in Barkin Ladi, Plateau. December 25: Kidnappers killed two and abducted fifteen in Munya, Niger. December 25: A sectarian militia killed six in Bassa, Kogi. December 26: Gunmen killed five in Barkin Ladi, Plateau. December 26: During a Boko Haram attack on Kukawa, Borno, one naval personnel and ten civilians were killed. Some reports indicate that Boko Haram has taken over the town of Baga in Kukawa, with seven hundred soldiers missing, but the Nigerian military refutes that assertion.